There isn’t quite as much information as was in his first book, but many thought-provoking ideas are presented throughout the book. I also liked how the author continued to write in a very accessible and understandable way, so that you don’t have to continuously read sentences over in order to try and understand what is being said.The first part of this book continues with the emphasis on psychology that The Invention of Religion contained and explores the evolution of some of the “key concepts” of religion that the author came up with in his first book. And the second half does some “debunking” of the Old Testament. But the whole idea of the gospels originating from performances really captured my interest, because it really seems to make sense and account for inconsistencies in the New Testament.Just like the last, this book seemed very logical with sound arguments. Highly recommended. This is a great "sequel" to Drake's first book since it uses the concepts developed in that book in order to take a look at the Christian religion. It's sort of like when you're studying a science and there's an "Applications" chapter where you get to put what you learned to use. However, this second book does not rely solely on the concepts of the first.Its major focus is on the Hellenization of Israel. 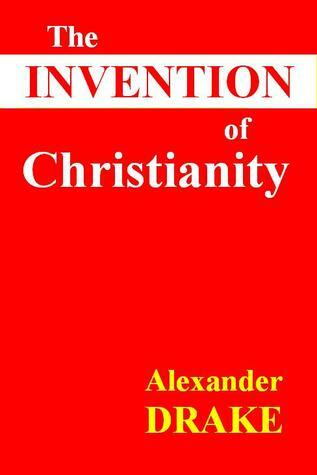 As stated in the Introduction, Greek culture spread due to the conquests of Alexander the Great, so The Invention of Christianity analyzes the effect this had on the emergence of Christianity. In my opinion, the author basically shows that Christianity is just Judaism with a Greek twist and then he goes on to show evidence that the Bible was written by humans, thus debunking the entire religion.The appendices are also interesting to read because I never knew why Christians thought the world was only 6,000 years old before. Overall, it is a tightly-structured book that is not filled with fluff, so the arguments are very concise as it puts Christianity in the cross-hairs. It's not quite as expansive as his first book, but still an excellent read in its own right.Part 1 involves a look at the influence the conquests of Alexander the Great had on the religion. The reader is introduced to the story of Dionysus and a comparison is made between certain elements of Jesus' life and Dionysus'. Drake brings up a very interesting idea about the gospels originally being performances. He also looks at the evolution of rituals and the afterlife in this part.In the second part of the book, Drake indicates that there is a fundamental conflict between what the Bible tells us about the world and what we observe about the world. Essentially, he shows that it's one or the other: either the Bible is wrong or science is wrong. But then he goes on to show that there is definite evidence that the Bible was written by people and did not "come from a divine source. "Overall, Drake does a good job providing evidence to support the ideas presented in the book. The book is not particularly subtle in its approach to biblical texts. It does not always properly distinguish between mythical OT accounts (creation, the flood) and historical NT accounts that have, admittedly, been edited to tie in with prophecies, to make philosophical points or under the influence of (notably Greek) narratives (e.g. the parallels between the Jesus story and Dionysian accounts, but also the very ideas of an immortal soul, afterlife and the heaven/hell dichotomy). But to ignore the difference between fictional "invention" and mythical styling, sometimes on grounds of circumstantial evidence, is a rather bold shortcut, which Drake seems to easily engage in. And there seems to be very little awareness of historical text criticism. Some naïve arguments run "this cannot have been written by God himself, because an omniscient God would have known this or that was false." Even so, the challenge to a literalist reading of scripture as divinely inspired authority remains, but it is more carefully documented in other books. This book was pretty bad. The book's premise is to examine the Hellenistic influence on the New Testament. It's a very short read, and fails miserably in that examination. In fact very little actually goes towards an examination on the Hellenic (Greek) Jews. My motivation to read it was due to Reza Aslan's Zealot (highly recommended) which began the conversation on the Hellenic (Greek) Jewish influence in Christianity, but that book ends on that note. I was looking for something that continued the story.However Drake's book uses tenous comparisons. Thankfully it was a quick read. I'm still looking for a book that examines the period from the war between James (Jesus's brother and leader of the Mother Assembly of Christianity in Jerusalem (Hebrew Jews)) and Paul's lust for power, and the Hellenic Jews that followed Paul's beliefs to gain favor with Rome, by integrating with Roman/Greek mythology in the New Testament. If you know one, I'll take the recommendation. A decent follow up to his masterpiece The Invention of Religion. This book is even shorter than his previous work, and I think this time the length does affect the quality. More than half of the 60 pages are taken up by the analogies drawn between Dionysus, the Greek god of wine and Jesus. I'm sure Mr. Drake could have added a lot more information in this book if he wanted to, he sounds knowledgable enough. Overall a quick read that is quite informative but just feels a bit too rushed. This contains several interesting insights into how Hellenization influenced Judaism, and how Dionysian myths likely evolved into the stories of Jesus that we know today. I found especially compelling the idea that the four gospels in the Bible were different accounts of the same play that might have been popular at the time, where scenes such as the Last Supper and the kissing of Judas were acted out in a theater. The minor differences in the gospels are then easily explained by the four authors seeing different actors of the same basic plot.Much of the book is conjecture, and the author is quick to point out that his conclusions are implied, but not confirmed. It's hard to deny the plausibility of his conclusions, though. That said, this book is not likely to convince anyone who believes in the divine authorship of the Bible. After I read and loved The Invention of Religion, I immediately bought this book. I had been anxiously awaiting a time to read it and finally got the chance this weekend. It was a good weekend. Drake writes with such accessible prose that you really understand the concepts he’s putting forth. And he’s very equitable and treats both sides of the issue with respect. I had always figured that there was probably a historical Jesus that the New Testament was based on, but this book made me reconsider that idea. It really makes a good argument about how Hellenization could have affected the Hebrew religion and invented new concepts like baptism, communion, and Jesus. This is a great little 'book' (though more of an essay, I thought) bring together ideas and information in a very accessible way. It focuses on the history of early monotheism and the cross pollination of religious ideas across polytheism and early monotheism, particularly Christianity. Very well researched and informative, and very well put together (especially for how short it is). I grew up Lutheran but never really was into all the singing and chanting. The whole religion made me wonder if it was just made up because half of it never made any sense. This book tipped the balance. I am confident now in my choice of atheism. This guy knows a lot about Greek religion but very little about Judaism. Was this a term paper for an undergraduate religion class?